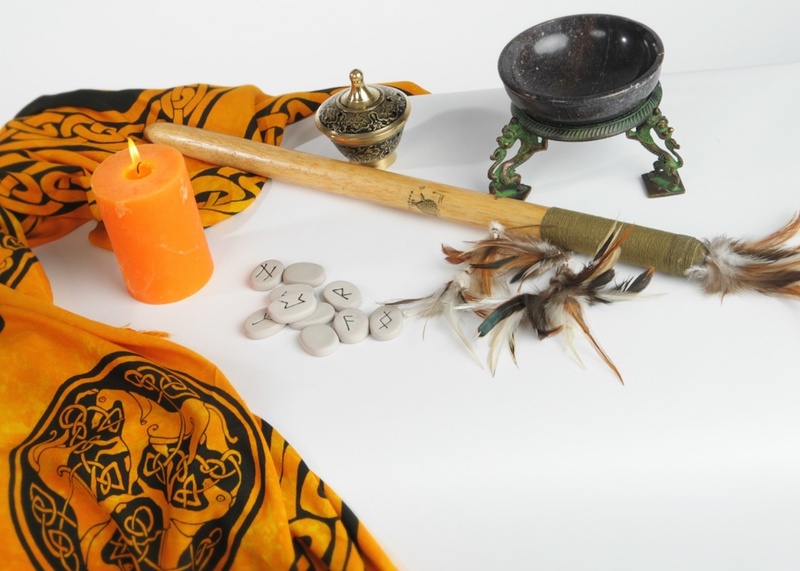 In this section, we will mention some of the main things we use when 'laying down' runes. Of course, there is no single interpretation to the meanings. For better understanding of rune, we recommend the book from Ralph Blum. The influence of the runes on their time was undeniable. Elliott writes that the tribal leaders and advisers of Anglo-Saxon England called their consultations, which they held in secret meetings, "Runes". As Bishop Wulfila translated the Bible into fourth century Gothic, he used in Markus 4, 11 ("you are given the knowledge about the secret of the kingdom of God") for the word runa "secret". From the beginning, the runes also had a ritual function, for divination and invocation of higher powers that could affect the lives and happiness of the tribe. The are of the rune masters touched every aspect of life, the most holy to the everyday, practical. There were runes and spells to influence the weather, the tides, the seed, love and health. Runes for fertility, and a curse for the abolition of a curse, for birth and death. Runes were carved on amulets, drinking cups and javelins, and carved on the lintel of the houses and at the bow of the Viking ships. The rune masters and vikings wore striking clothes, which you could recognize easily. Adored, welcomed and feared at the same time, those shamans were familiar figures in tribal circles. There is evidence that a sizable number of runes experts were women.The detailed operation of a similar tradition is much older and is from the Roman historian Tacitus. In the year 98 AD, he reported on the customs of the Germanic tribes. Although in later Anglo-Saxon period alphabets included up to thirty-three sign, the traditional Germanic Futhark script consisted of twenty-four runes. These were divided into three "families" of eight runes, it was said that the numbers three and eight, had special magical powers. The three groups (aettir) were named after the Nordic gods Frey, Hagal and Tyr. Odin is the chief god in the pantheon of Norse gods. His name is derived from the term for "wind" and "spirit". Through his suffering, his self-sacrifice, Odin brought the runes to us. According to the legend, he hung for nine nights on the Yggdrasil tree, the world ash tree, wounded by his own sword and tormented by hunger, thirst and pain. He was alone and without any help, until he was near to death, then he he saw the runes and, with a last, mighty effort reached for them and got them. Do you have a problem to make a decision? Don't you know what should be your next step? Can't you predict the consequences of your action? We will help you to look into your possible future and we will accompany you in the process of decision-making. Try to imagine how many things you would do differently, if you knew their consequences beforehand? That is exactly what we will help you to make real. Remain modest - that is the right of the oracle. Be in the world, but not from the world. Stay receptive to impulses, that come out of the divine in the inner and outer sphere. Seek to live the usual life in an unusual manner. If you take the 'itself' rune and cut through it in the middle, you are going to receive the rune of joy and its reflection. So there is a fine warning not to be careless. The acrobatically dancing energy of the balance is asked here to bring its higher itself. Nothing in the excess - that was the second request that was to be read at the entrance to the delphish temple. The first advice read: Recognize you yourself! If this rune is pulled, that is a sign that unity, union or partnership is near. But you are requested, not to throw yourself into this connection. A true partnership can only consist of two independent, healthy beings, that preserve there own independence also in this union. This advice is important at all levels: in romantic relationships, in commercial things, simply in partnerships of every type. Fehu is the rune of fulfillment: ambition satisfied, salary received, fulfilled love. It also promises food, from the commonplace to the holy divine. This rune requires a deep exploration of the importance of profit in your life. Another aspect of Fehu is the conservation and preservation of what has already been won. Caution and vigilance are necessary, especially in happy times. Even if there is a reason for celebration, don't be distracted by reckless bliss. This is the time of your ways separating. Old skin must shed, outdated relationships need to be given up. If this rune appears, a "molting" is necessary. Othila is a rune of the radical separation. Obedience and probably also withdrawal is necessary - to know, when and how you need to withdraw, and to actually have the determination, to do it. Property is also an aspect of this rune, because Othila is the rune of the acquisition and profit. The profit however, that "heir", which you receive, could likely be made of something that you need to abandon. This process can be especially hard if that what needs to be abandoned is something of your cultural heir and backing. Not 'rigidly' but rather like a 'river' is the correct attitude to have. And yet - you have to wait that the universe begins to act. The rune of the termination and new beginning. If it is pulled, it means that the life you used to live has grown out of its frame and needs to be left behind now, so that the life-energy can liberate itself, like a rebirth, into a new one. Be prepared for the chance, that hides itself behind the costume of loss. At the same time modesty is demanded, because in order to rule, you must serve first. Deep, inner trans formative powers are interacting, but what you are going to get out of them isn't easy to recognize. An integrity – concealed, disguised, secretly hidden. After all, what is going to heal us and our soul is a deep mystery. On the side of the material world there probably will be surprises; unexpected profits are nothing to be excluded. Nothing less than a renewal your spirit is the risk you take. The old way found its end: You simply cannot repeat the old things any longer without suffering. However, you always have a chance: Either you see all negative as a "misfortune", or you recognize the entire as a hindrance stretch, an inaugural way that you have to follow at this moment. Our lesson is the necessity of bearing strong enforcement. Your positive aspects can be controlled by the people who surround you. To pull this rune means to get a hint that there is going to be stagnation - an occasion to re-consider your plans carefully. It is the time to pay off old guilt and even if it's easy it is time to restore balance. Therefore improve, reconstruct, organize: if the fishermen cannot pull out, they repair their fishing nets. You must deal with and face your own demons. So keep your anger as well as your impulses under control. Modesty and a good mood are essential in such times. It is the completion of the initiation that Inguz needs. It may indicate a time of joyful liberation, a new life, a new way. As a rune of great power it means that you have the strength to reach you completion, the solution from which there is a new beginning. The completion, the finish/finalization is most important. This Rune indicates that you have to fertilize the soil for your own liberation. Everything is changing, and we cannot live constantly in the midst of obstacles. This is about the control of emotions. During transition periods, changing the course of life and accelerated self-change, it is important not to rush into emotions, either positive or negative. Remember that early action and right conduct are the only real protection. No matter whether your business flourishes or fades, don't worry. Maybe you don't win, but you will never lose, because you will always learn from what has happened. Moderation and civility are the strengths of the protective forces of this rune. During our tests, we gather the strength to ward off, repel blockades and defeat. At the same time we develop an aversion to the pattern of behavior that lead to tense situations in our lives. Patience is the advice of Eihwaz. No hassle, no action or yaw for a desired result is necessary. Perseverance and caution are required. Avoid foreseeable difficulties by doing the right thing. Eihwaz means to see, despite inconveniences and discomforts, growth is still encouraged. The keyword is receiving - messages, signals, gifts. Even a timely warning can be received as a gift. If the messenger rune brings holy knowledge, one is probably blessed. Put effort into every meeting, visits and accidental encounters, be especially attentive and aware – in particular with people, that are wiser than yourself. In the opposite situation, Ansuz says: Think of the positive aspects of the unfortunate. This rune is the fruit-bearing branch. Time of travail is gone and to some extent you have found yourself. The necessary change is now behind, and you are free to receive its blessing, either material or emotional or an increased well-being. Wunjo is a rune of restoration of a harmonious combination of limtting the ego with the higher self. Properly seen, everything is a test. Consciously in the present, honest to the others and with confidence in your way, you should know that you cannot fail. Jera, eine Rune des guten Gelingens, bezieht sich auf jede Aktivera, a rune of good success, refers to any activity or effort you devote yourself. To see this rune is an encouragement to remain in good spirits. But you should know that quick results cannot be achieved. A period is always associated, therefore the keyword "one year", which stands as a symbol for the full cycle of time that is before the harvest or exemption/liberation. This is the rune of opening, the new clarity, the expulsion of the darkness that has obscured/covered a part of your life. Now you are free to experience the joy of giving. Kano is the rune for the morning full activity, for sincerity, clarity and concentration, which is all important if you are getting ready for your job. This rune offers its protection: the more light you have, the better you can see what is irrelevant and outdated in your setting. This is the rune of the spiritual warrior. His fight is always the limiting ego. His will is strengthened by the act, but the warrior outcome, and he always knows that he cannot do anything but hinder himself because the will of heaven will prevail – these are his marks. This rune also contains the energy of the distinction. Patience is the virtue of this rune. You are asked to look inwardly, to dive down to the foundation of your life. If you dedicate your question to a certain case, an idea, a certain way, the Warrior Rune recommends perseverance, even if sometimes endurance is required in the form of patience. What are your priorities? How do you use your energy? The Rune Teiwaz stands for courage and devotion. Berkana, the rune of the life process, another cycle rune, which stands for fertility, which leads both symbolically and actually to growth. Berkana is about the power to influence development and the nature in which it flows into your body. Its action is gentle and penetrating. Scatter the resistance first, then accomplish your work. To make this possible, your wish must be clear and controlled. Conversely, events, or, more likely character aspects distract the growth of new life. Ehwaz is a rune of passage, of transition and movement: location changes, relocation, new attitudes or new life. This rune also represents movement, such as improving a situation. This rune is combined with gradual development and continuous progress, even slow growth of some changes and transformations. Conversely, movement that seems to block. Make sure that what you do or do not do happens at the right time. There are no missed opportunities, we only need to recognize that not all opportunities are intended for us. Invisible forces are at work here, creative and productive forces of nature. The attributes of this rune are water, liquid, ebb and the flow of tides and emotions, of careers and relationships. The key to success lies in the contact with your intuitive knowledge, in the mood for your inner rhythms. Conversely, warning against exaggeration, from excessive striving. An advice against the attempt to overestimate your own forces or to work over the top for your own property. Change, freedom, invention and caution are attributes of this Rune. To pull it indicates the existence of an urgent need in your psyche to free itself from the confines of identification with material reality, and to experience the world of archetypal thinking. The Rune of elementary destruction and of things that are completely outside your control. Hagalaz is only upright, not vice versa, and yet it always works through the reverse. If you pull this rune, you can expect resolution, because it is the big 'awakening. The more serious the damage is in your life, the more important and contemporary are the requirements for your further growth. With the symbol of the gateway the rune shows that there is work for you, and both inside and outside of yourself. Thurisaz is the Rune of non-doing, therefore the gateway is not to reach, or to pass through without contemplation. This rune reinforces your patience, now is not the time to make decisions. Thurisaz, conversely, requires contemplating. Urgent decisions may be regretted later on, probably because you are acting out of weakness. If it is pulled, it shows a greater thrust or breakthrough in the process of self transformation. In every life there is at least one point that –it is detected and accepted- it is going to change this life forever. So you can have absolute trust, even when the moment requires that you jump empty-handed into the void. Sometimes this Rune leads also to a major phase of success and thrive. The winter of the spiritual life has come upon you. You may find yourself trapped in a situation whose importance you cannot recognize effectively. You are powerless to do anything other than to bend, or even pass on a long-held desire. Try to find out what it is, what you hold, the effect of this situation and let it go. Enter by and be silent, because what you see is not necessarily a consequence of your actions and habits, but the circumstances of the time, against which you cannot do anything. To yield shows courage and wisdom. This rune is about the communication, the mood of something that has two sides, two elements, and about a different reunion. Here grows the intrinsic value, and at such times, we must remember that it is not envisaged that we rely totally on our own strength, but instead ask ourselves what is the right action. This rune stands for wholeness – so for that which our body needs. It embodies the impulse for self-knowledge. As a great power rune Sowelu shows that the life force can be available for you and that there is a time to recharge and regenerate again. Here again a warning of being too cocky. Meditate on Christ's words: I can do nothing of myself. From our own strength we cannot do anything. Empty is the end, empty is the beginning. Like the phoenix from the ashes it rises - from what we call fate. The surrender of control is the supreme challenge for a spiritual warrior. If you drag the blank rune, take courage. Trust that the universe will make self change in your ongoing life progress. Who keeps searching, will find! Haven't you found what you were looking for? We invite you to search also on our other Websites. Are you feeling sick, weak or experience an overall lack of energy? Do you need to solve your current situation or problem with the help of magic because all other solutions have failed? Try to solve your problems with us, we're looking forward to hearing from you! Find balance, peace and new impulse in our magic office. Find the answers to your questions, our individual counselling will help you to take the right decision.